Based on manga series "Shigatsu wa Kimi no Uso" by Naoshi Arakawa (first published May, 2011 in Monthly Shonen Magazine). Filming begins October, 2015 and lasts one month. 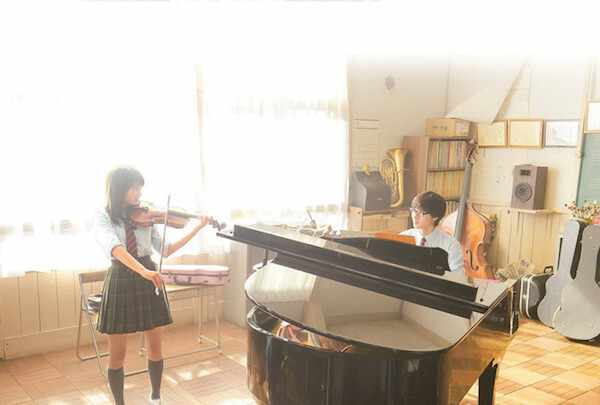 Kento Yamazaki & Suzu Hirose practiced playing the piano for 6 months prior to filming the movie. Mindy Sep 28 2018 12:39 am I absolutely loved the female and male leads in this drama, especially that really subtle chemistry between them. I'm not a musician, but the pieces they played together truly fascinated me and made this movie really enjoyable to watch. Despite its emotional ending, this story felt truly fresh. The acting was quite well executed and it kind of amazed me how Kosei's fears could be applied to our own lives and how Kaori was a reminder of the kind of person we should strive to be- completely free. assassin Aug 11 2017 8:56 pm I loveeeeeeeeeee the movie. I love the casts, cinematography, the OST, I just love everything about this movie. Looking forward for the two main roles to get casted again in the future. Tokio Aug 04 2017 10:12 am Acting aside, after watching first few episodes of the anime, i can visually imagine Twice's Momo playing Kaori because of the blonde hair. But yeah she's not an actress and i'm just wondering that Kaori's look instantly reminded me of Momo. kimchita Jul 21 2017 8:48 pm unpopular opinion, but i like the live action more than the anime. the reason is because in the anime, there are a lot of unnecessary characters background that i don't care about like Kosei's rivals and the girl who played piano with Kosei too (what was their name again?). Meanwhile in the live action they're just concentrate in Kosei and Kaori's relationships and that's a plus for me. Plus Suzu Hirose and Kento Yamazaki did a good job in this movie. You can't think about anyone else playing this character than them. Every scene is beautiful and well taken too, its memorable. Rosy Chan Apr 23 2017 4:58 am This movie is just great! The story is so amazing and touching, and the main actor and actress are so pure and sweet! Nice job! It's a very very fantastic movie although it couldn't be as great as the anime version! ianz Apr 20 2017 8:09 am what is the title of song that kaori play with melodica on park with group of children? Dooffff Apr 15 2017 10:22 am I like this movie but the anime version is better. They did not show the old picture of kaori with kosei in the back. Aniki Apr 11 2017 10:33 pm I think the anime version is much better than live action. elMstba Jan 19 2017 5:02 pm Oh My God! I Love that so much. Angel Hidalgo Dec 11 2016 4:19 pm Where in japan is the film location of this movie? YLIA Fanboy! Dec 11 2016 7:41 am What's the Wacci song that was playing when Kousei and Kaori were shopping? Someone tell me, I've been searching for ages hahaha! It is a heartwarming tale that leaves you with tears and a smile on your face at the same time. It also has a strong cast, but Hirose Suzu and YamaKen stole the show. These two young stars have a bright future ahead of them. No wonder, YamaKen is getting a lot of offers. :) The cinematography and the music are also fantastic. adi moon Nov 27 2016 2:51 am i love the story based on the anime and then they turn into reality.. i love the concept and pairing the characters are great and so on. i have to tell that i myself give u.... hands up! HaruHaru Oct 12 2016 5:32 pm Looking forward to this movie coz of Kento! First saw him LDK and fell in love with him immediately! Just finish watching girl & 3 sweetheart and I swear he is driving me crazy with his hotness! He definitely have improved alot in his acting skills and I just love how he is able to portray his icy cold attitude yet caring towards the girl! And btw he look so good with tanned skin and rounder face! jisoo's wifeu Sep 27 2016 2:12 am ok but Kento tho...L who? Gem Sep 21 2016 9:21 pm She played the violin well and she did a great job portraying Kaori. So yeah, instant admiration for Hirose Suzu! Gem Sep 21 2016 9:13 pm Hirose Suzu is perfect for Kaori's role. I am a big fan of the anime version of Kaori so I'm really glad they chose her. syaoran_9 Sep 02 2016 3:52 am Aren't anyone curious who will be playing Igawa Emi and Takeshi Aiza??? zoto Aug 14 2016 12:37 pm Suzuuu hiroseeee ! Suzu hiroseeee ! Why always yamaken !! blue Aug 09 2016 9:52 pm i'm glad kento is playing more... complex(?) characters this year. seems like he's improved his acting judging from the trailer, can't wait to watch it! lord sotong Jul 08 2016 4:11 am @wew kk wew: Kentolol stronk!!! KentoIsLove Jun 26 2016 10:28 pm Kento again!!! I don't mind it all at! He is so cute and he's such a god actor that I've seen all his movies! I will patiently wait for another Kento move! kentilll Jun 24 2016 11:06 am @hannah: Haruna can't act and she's too tall, while Mitsukin is too chubby for such role and a little too old to play high school kid again. Kento here, kento there, kento everywhere!! Renan China Jun 13 2016 9:39 am It's time to cry in live action!!! Apple Rose Ledesma May 26 2016 11:41 pm I was expecting for a more prettier (with long wavy hair) and slimmer figure since she's supposed to be frail and very light for Kaori's character. I am more curious though for Tsubaki and Kousie's one sided love. I think Kento deserved to be in it coz the guy's working really hard. His face is extremely good for manga characters and he's really good at it. I am so excited for this one! Yumi May 15 2016 10:47 pm guys guys, it always happens, now and even back then. if you're popular, you're gonna get cast in a lot of movies and dramas. also, he's at the right age for these kinds of movies. trikuta Apr 19 2016 8:40 am god this kento san looks good no matter which character he plays , and he is rocking those glasses!! Deez nuts Apr 11 2016 9:51 pm I loved this show so much and if your reading this go to jw.org it's great for kids, teens, couples and, parents. Mina Apr 01 2016 1:39 am Yeay, suzu chan and kento kun. They're my idols. Looking forward for this movie. renamiko Mar 31 2016 2:40 am yama kento is shojo-actor san ? LOL, why?? what a bored actor san. hope he take some break,give us some break huh..? i am affraid every manga i love i would find him as the lead male. hope he take some break for a year before he lead a drama/movie again with different genre. Kuro Mar 28 2016 2:21 pm cant wait! lee Mar 16 2016 3:05 am justice for taishi nakagawa's screen time..
Monica C Mar 10 2016 10:19 pm So, the teaser is already released. 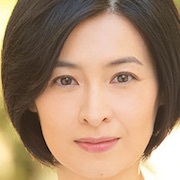 Hm, IMO kaori in this LA looks like more childish. Before the teaser was out, I had a high expectation of this movie. But, somehow suzu make me worried. She played violin not seriously. Kaori is someone who really love music and violin, if suzu can't reach the feeling... I don't know what to say... but, it's just teaser, just 30 second. we can't judging the movie right now. hope that suzu can play as kaori so well. And somehow, I felt that Komatsu Nana it's more fit as kaori. Just IMO. so, what do you think, guys? Christine Feb 17 2016 5:02 am This is the live-action that I'm waiting for! It's supposed to be released before Ookami Shoujo, right? But why is it that OokaShoujo has released more trailers than Shigatsu? Kuma-chan Jan 30 2016 9:41 pm When will this be out!? I can't wait to watch it! Even though I'm not content with the ending too much, I love this anime to death! A. Widhi Jan 14 2016 5:13 am I wanted that Kaori Miyazono becomes paralyzed and coffined with wheelchair after graduating from middle school and finally become bedridden shortly after graduating from high school (if Kaori still alive). In here, Kaori Miyazono has surgery in winter, after surgery she will put in induced coma for a week. She will survive after one week coma. She's still alive, but she must use wheelchair due to side effect of the surgery, her legs are numb and can't be moved so she wouldn't be able to walk anymore, but she still be able to play violin. Kaori Miyazono will use wheelchair in spring after graduating from middle school until in spring after graduating from high school. Several months after finishing high school, Kaori Miyazono will be bedridden as her condition worsening. She will have two years being bedridden. At age 20, Kaori Miyazono will has repairing surgery in fall and can walk again. At the same time, Kaori Miyazono has cured from her disease. Then she will become the concert violinist after she cured for many years. Although she's already fine, but she must take medications daily for lifetime. Pls Dont Disappoint Jan 10 2016 3:08 am I'm already teary-eyed just thinking about this being played out in a movie-length live action adaptation. I hope this meets my expectations of slimming the more boring parts of the story down and letting the whole Friend A (Kousei) x Kaori relationship blossom on screen. I hope it doesn't disappoint me, this is something I've been looking forward to since the announcement. NANA Dec 13 2015 8:47 am Anna Ishii is too cute and too feminine for Tsubaki role.But I am sure she can make it. 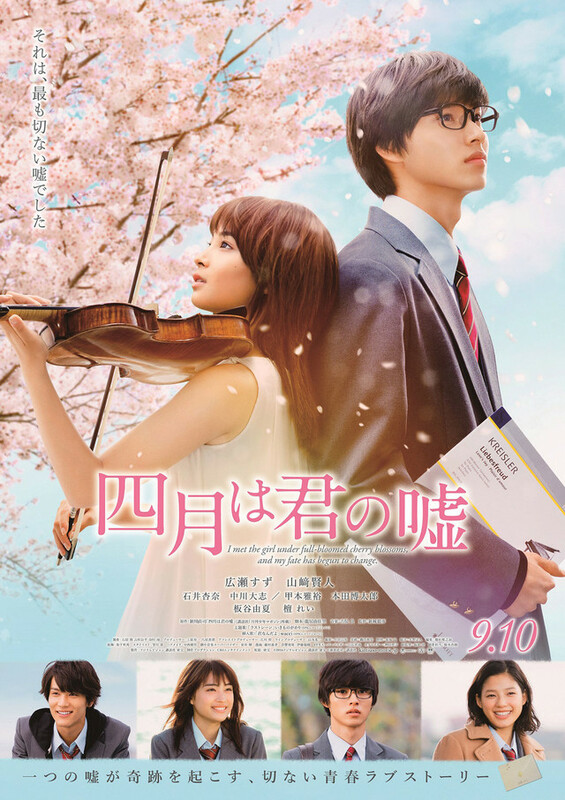 Faye Nov 02 2015 1:17 am Suzu Hirose x Yamazaki Kento pair.. Can't wait for their movie. And Suzu & Taishi had filmed an advertisement together. They're so cute in Shiseido SEA BREEZE ads, similar to a short movie on its website. azkya Oct 18 2015 6:43 pm Wow!! Because of you I found this anime. Yamazaki kento san when you come to Indonesia? The beautiful country.. I'll be waiting for you to come to Indonesia. PRR Sep 06 2015 8:00 am Wow Yamaken EVERYWHERE !!! zaizai Sep 04 2015 11:23 pm Wow another Yamaken movie, he's really in demand now,I'm so proud of him..and Suzu chan is Soo kawaii, they look good together.. I wonder if Kento kun is still sleeping, Soo much blessings on his way...ganbatte!!!!! danaexol Sep 04 2015 1:37 am ommgg kento <3 i can't wait ! !